How to create exceptional managers and teams – a snapshot. 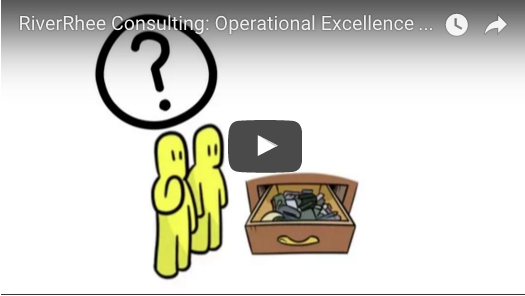 RiverRhee Consulting newsletter, January – February 2016. The seminars and workshops that we have been delivering during January and February have been typical of our work in enhancing team effectiveness. So we thought we would share four aspects, and eight tools representing some of the most popular approaches. 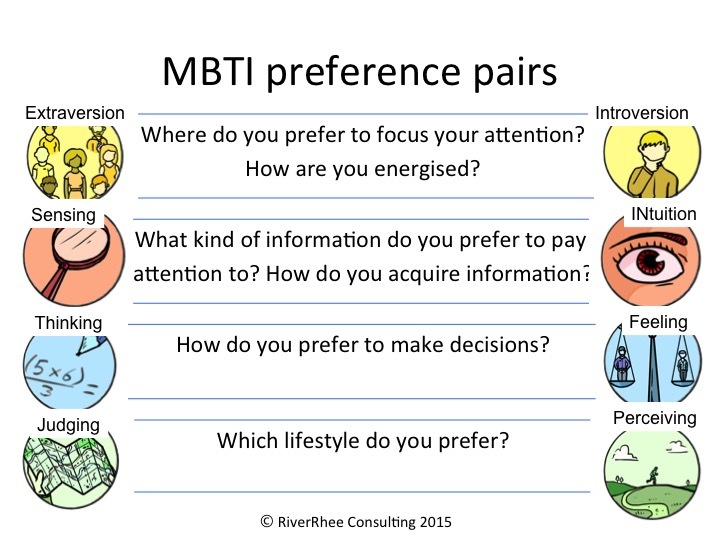 We started the year with a team workshop using OPP‘s MBTI ‘flip-a-type tips’. It’s an insightful tool for understanding the dynamics between people. Through it you can explore your respective strengths and how to work more effectively together and build stronger relationships within the team. The Belbin Team Roles also continue to provide valuable insights on how to make good use of the diversity within a team and also the gaps that the team might want to address. We delivered two in-house courses where we used scenarios to bring this diversity to light. 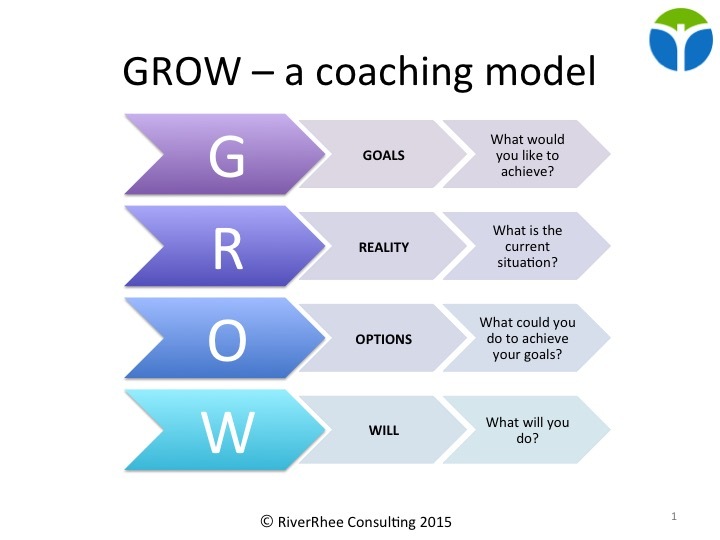 The GROW model of coaching continues to be a favourite in our team workshops and management training courses. This simple tools enables managers to switch from a directive to a supportive approach, and to cultivate individuals’ ownership and initiative in solving their problems. Active listening and open questions are key to a manager’s effectiveness as a coach. I’m exploring ‘clean questions‘ with my peers in my NLP learning group as an additional tool to support this. More on this in due course. Managers and teams are subject to continuous change – whether they are leading it or dealing with its implications. I’ve spoken in two recent seminars in my capacity as committee member of the APM Enabling Change SIG and as a practitioner / trainer in managing change. Delegates at one of the seminars had a good discussion that have helped us to identify more common factors for managing successful change. I also continue to be passionate about the things we can do to create navigators rather than victims of change. We’ve delivered two Lean Sigma courses this month during which I introduced our new 5S video developed for us by John Stinson. Like many Lean Sigma tools it gives you a structured approach to a relatively simple concept that can make a big impact on an individual’s or team’s work. Several of our delegates indicated that they would be applying it to their desk, in their labs or in their storage areas. 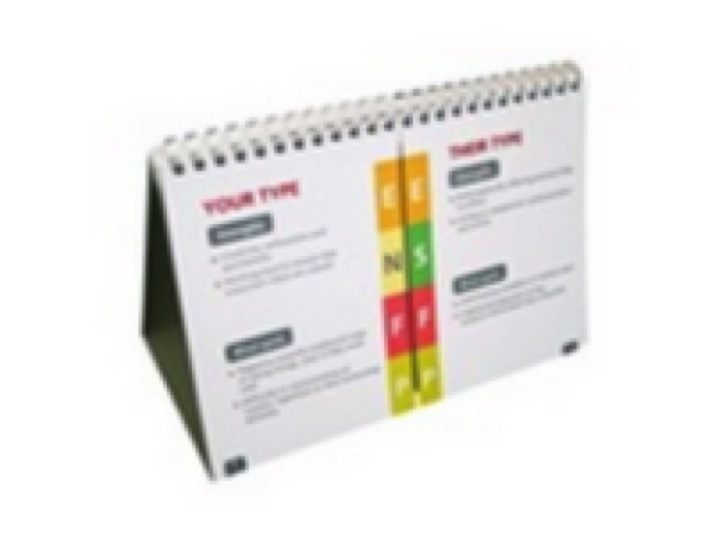 How to make better use of their time continues to be one of the challenges faced by the managers attending our courses. The Mind Gym’s mantra that “there will never be enough time” to do all the things we want to do, but the main thing is to be happy about how we are using it, continues to strike a chord. 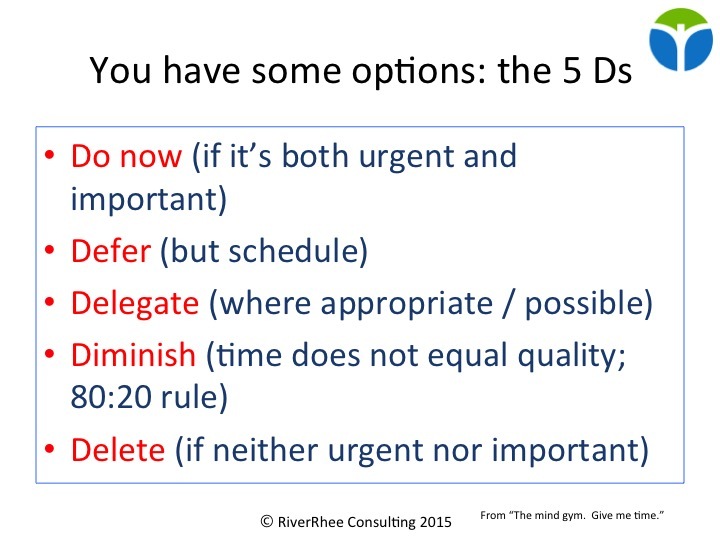 The “5 D”s combined with Stephen R. Covey’s urgent/important matrix are simple tools that are popular with our delegates. Our portfolio of courses can be adapted and expanded to match your own portfolio of requirements so that your managers and teams get just the training and development that they need. For instance we have recently carried out a training needs analysis for an SME and designed a one-day Management Training workshop for their managers. And we have created a couple of new half-day courses at the request of another organisation one of which “Effective Influencing and Communication” has now been added to our portfolio. We can carry out a training needs analysis for your organisation and design the right content just for you. Or you could take a look at the full list of RiverRhee’s training courses and contact us with your choices. Do get in touch to help us deliver the right portfolio and approach for you. Why focus on performance reviews and appraisals? It’s that time of year again when managers and their staff are preparing for performance reviews and appraisals. It’s a topic that can be very emotive. If done well it’s a tremendous opportunity to build engagement, generate fresh energy, and position the organisation for growth and innovation. If done poorly or not at all, performance reviews can be serious demotivators and lead to organisational stagnation and attrition. Performance reviews and appraisals and how to do them well were the subject of animated discussion in two recent management courses that Elisabeth Goodman and Janet Burton ran with One Nucleus and with the Herts Chamber of Commerce. The following are some of the key points that emerged from these and our previous work supporting SMEs (Small and Medium Enterprises) in particular with their performance review and appraisal processes. Although the formal review takes place once a year, it should definitely not be the first time that comments on requirements for improvement, or positive feedback are exchanged. Nor should it be the first time that issues with or adjustments to objectives are first discussed. These things are relevant to day-to-day work and should be discussed as they arise. What is often quite striking when we work with SMEs is how well connected and engaged people usually are with their organisational goals. There is a clear connection with what the organisation wishes to achieve and the individual’s role in supporting that goal. This is something that can be harder to achieve in larger organisations where there can be quite a gap between the two and quite a delay before objectives are confirmed for the coming year. This aspect of personal objectives is what helps to make the discussion a two-way process. As SMEs are by definition often small there may be limited opportunities for progression through management ranks, but this should not be an excuse for limiting career development. Motivators for people in SMEs are often self-actualisation or, in the words of Dan Pink, mastery and autonomy. Providing opportunities for personal and professional development should be possible whatever the size of the organisation. People may be dismissive of acronyms but this one is a useful one to ensure that both the individual and their manager are unambiguously clear about what they have agreed and how the successful achievement of objectives will be assessed, whatever the individual meaning of the letters. We use the terms Specific, Measurable, Achievable, Relevant, Timed and that seemed to work for the delegates on our courses! How effective is your performance review process? Do you have variations on these five golden rules? Let us know if you would like us to tailor our performance review and appraisal training to help you with your process and coach your managers and staff for greater engagement, innovation and growth. 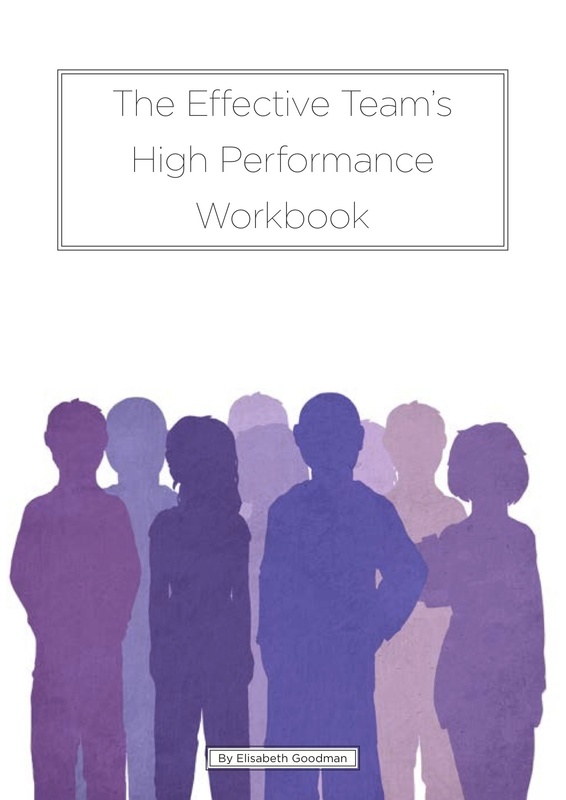 You can also read more about this topic and other ways to create high performance teams in Elisabeth’s book “The Effective Team’s High Performance Workbook” now available from Amazon as well as through the RiverRhee Publishing website. RiverRhee gained Cogent Sector Skills Council accreditation during September, which, amongst other things, means that our courses can reach more small businesses across the UK. We are offering our Introduction to Management, Introduction to Lean Sigma, and also Managing Change courses through Cogent. We will be active on the Project Management front again in the coming weeks. Elisabeth is now leading the Capabilities and Methods Pillar for APM’s Enabling Change SIG (Specific Interest Group). She will be co-presenting at APM’s Project Management in Practice event on behalf of the SIG, and will also be running the Effective Project Management course for TFPL in November. Do get in touch if you would like to find out more about RiverRhee Consulting, our range of off-site and in-house workshops, and how we can help you to create exceptional managers and teams. See the RiverRhee Consulting website or e-mail the author at elisabeth@riverrhee.com. See below for a table of RiverRhee Consulting newsletters prior to 2011. The usual posting order of blogs is in reversal chronology, but these newsletters were transferred from a previous site, hence the actual chronological order! RiverRhee Consulting, enhances team effectiveness through process improvement, knowledge and change management. Follow the link to find out about how RiverRhee Consulting can help your team to work more effectively for greater productivity and improved team morale. ‘Finding our voice’ – a route to greater employee engagement and empowerment? When Elisabeth Goodman first left full time employment after 21 years in a FTSE 100 company, and a previous 4 years in a similar corporate environment, she had an exhilarating sense of freedom and opportunity to exercise her talents and wits in whatever way she wished. Fifteen months on she’s very pleased with the choices she has made, and the new path she has carved out for herself as Owner and Principal Consultant with RiverRhee Consulting. However, her conversations with those who are employees and her experience of running work-shops, seminars and training courses on process improvement, knowledge management and change management, continue to convince her that employees will be more ‘empowered’, more engaged and more motivated in their work if, as advocated by Stephen R. Covey1, they are encouraged and helped to ‘find their voice’. One way we can ‘find our voice’ is by re-thinking our careers2. Those of us working for employees should think about what career paths we want to steer in life – and engage our line managers in personal review & development discussions accordingly. Thinking in this way can help us to view our roles within the organisation differently and perhaps take more of a leadership, creative and continuous improvement role within the context of our remit. It can help us to approach our work with a ‘self-employed’ attitude. Those of us who have worked for the same employers for a long length of time, and are now branching out into something new, can find ourselves bravely re-examining what unique offerings we can bring to our potential new employers, or customers. It may be the first time in a long while that we realize we have a choice, and how difficult that choice can be. ‘Do more great work’ by Michael Bungay Stanier3 is a very good, exercise-filled guide to discovering what’s important to us in our work and how we might get to do more of it. Bradford D Smart advocates that we should each take responsibility for finding those positions or roles where we can be “A” players, instead of being satisfied with playing a “B/C” role. He argues that, in the right role, we can all be A players. He suggests that people perform periodical personal career reviews of their competencies relative to the marketplace, and that we cultivate networks of knowledgeable people as well as reading widely and attending seminars and trade-shows to help us with this. It’s a sad paradox that in difficult times, many of the people that get laid off are those who have the knowledge that could help the organisation out of recession. In a recent blog based on 2 articles from the Observer on employee engagement8, Elisabeth Goodman makes the point that companies’ focus on employee engagement and on the tools to facilitate and measure this engagement are important, but will only work if the people involved are: doing the jobs that they enjoy; supported in the skills that they need to do them effectively; ‘empowered’ (or have control over) how they do their jobs and can improve them; and have a belief (endorsed by their managers) that what they are doing is worthwhile. RiverRhee Consulting approach to working with organisations, and running workshops, seminars and training courses is to develop people’s capabilities and encourage them and their managers to use their knowledge and expertise so that they are ‘empowered’ to be creative, and be leaders in finding ways to continuously improve their work. “The 8th Habit. From effectiveness to greatness”, by Stephen R. Covey. Simon & Schuster Sound Ideas,1980. 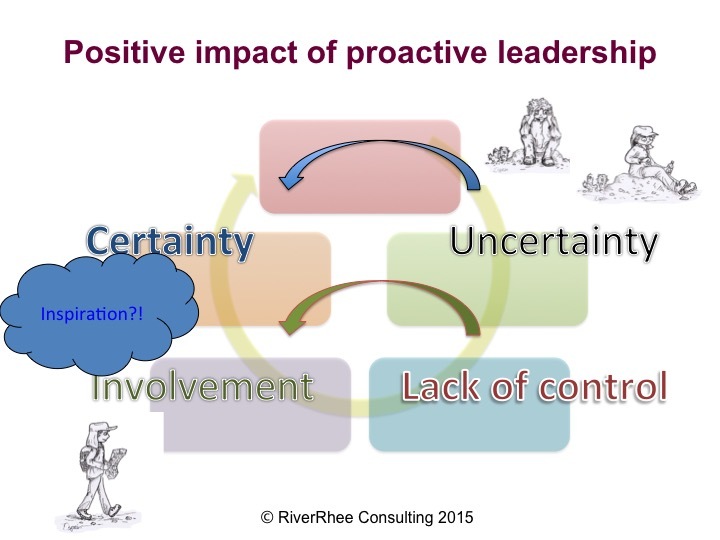 “Predictable results in unpredictable times”, by Stephen R. Covey, Bob Whitman and Breck England. FranklinCovey Publishing, 2009. Elisabeth Goodman is Owner and Principal Consultant at RiverRhee Consulting: enhancing team effectiveness using process improvement, knowledge management and change management. Follow the links to find out more about RiverRhee Consulting, and about Elisabeth Goodman.